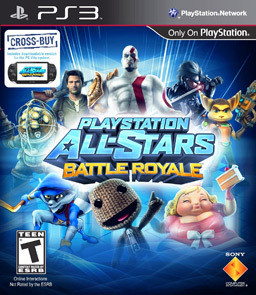 Unfairly compared to it’s Nintendo counterpart, Sony’s PlayStation All-Stars Battle Royale is a platform fighter that manages to hold its own in the genre, despite Smash Bros.‘s immense popularity. Even so, while it can be considered it’s own game in it’s own right, many aspects of the game were less than stellar, which is a shame considering the positive points it has to offer. All the playable characters have their own storyline and reasons for joining the tournament being hosted by a mysterious entity. The players soon find themselves in familiar and unfamiliar settings as their worlds are amalgamated into hybrids, creating areas that are lethal if they do not adapt. I can understand why Nintendo-biased fans would attack PASBR – although they might be similar in their gameplay, idea and genre, this is wholly unjustified. The game provides a new take on the platform fighter, while retaining elements of the genre that are exciting and invite fans to play. This in itself gives it enough credibility to be considered it’s own game and not simply a Smash Bro. rip-off. The game features 20 (not including DLC) unique characters to enjoy, each with their own skill sets, combos, stats, and finishers. This gives players a large sense of diversity, keeping the game from being too repetitive. To gain points, characters must fill their AP meter in order to gain finisher levels that can kill other characters. All characters have distinct Level 1, 2, and 3 finishers, the lowest of which being the easiest to reach and hardest to use while the latter of which is the hardest to reach, yet easiest to use. The playing field is set in platformer style and are dynamic, often changing at intervals and introducing hazards that can injure or affect a player in some way. Items in the game also range from Playstaion franchises, and can be used to either enhance player performance or damage enemies. It features the standard game modes that you would normally expect from a game like this – Arcade (which is one of the lowlights when compared to the overall game), Challenge, Versus and (most importantly) Online Multiplayer. I must say, while the overall gameplay is good, it would become boring very quickly if it weren’t for it’s Versus and Online Multiplayer mode. The character models, backgrounds and fighting animations are really well done, and are in my opinion much better than any other platform fighter that has been made. The game is not entirely perfect though – it suffers in it’s poor menu execution (honestly, it seems very amateurish) and the story still-frames in Arcade mode. This is an important note to ANY game: If you include a storyline, do not oversimplify it. It needs to be engaging, and two still-frames just don’t cut it. Moving on, the music fares slightly better in it’s presentation. It can be said that Smash Bros. does this better due to it’s large variety of well known hits, and while PASBR does this to a lesser degree, players are only given a below average score that rely on sudden shifts, sound effects and voice overs to keep players engaged. Overall, while it’s music and some visual aspects are subpar, PlayStation All-Stars Battle Royale is an absolute delight to play against other people. It’s actually a shame that it didn’t receive more attention, as it costs fans from more DLC characters, but I suppose there may have been some reasons for that. If you enjoy platform fighters, or enjoy the cross-over aspect that is more commonly observed in Nintendo’s Smash Bro. franchise, be sure to check out PlayStation All-Stars Battle Royale for a newer and different experience. Recommended? Don’t bother playing by yourself – go online!